These are always a huge hit whenever I make them. 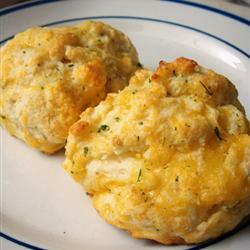 They taste just like Red Lobster's and go great with my Baked Potato Soup recipe. Enjoy! Combine Bisquik, cheese and water in a bowl and mix until dough is well incorporated and firm. I used my Kitchenaid for this and it works beautifully! Using a small cookie dough scoop, scoop dough on to a greased, foil lined or silicone baking sheet. Bake at 375 degrees for about 10 to 12 minutes until golden brown. While biscuits are cooking, combine topping ingredients in a small bowl and as soon as biscuits are done take a brush and slather the butter mixture on each biscuits immediately after you remove them from the oven. I do this while they're still on the pan and let them sit for a couple minutes to let the butter soak in. Place on a plate and they're ready to eat! **Disclaimer- once again I forgot to take a picture when I made this so I graciously borrowed this picture by searching "cheddar biscuits" on google. No copyright infringements intended and I do not own this picture!